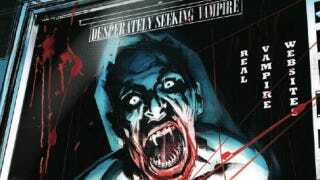 With New York Comic Con in full swing, we're psyched to bring you a seven-page preview of some brand new vampire insanity! Next week, Steve Niles' Alaskan nosferatu epic continues with the 30 Days of Night ongoing series, which boasts artwork by none other than Sam Kieth, creator of The Maxx and Zero Girl. Written by Steve Niles, art by Sam Kieth, covers by Kieth, Davide Furno. Fright-master Steve Niles returns to the creation that launched his career for an all-new 30 Days of Night ongoing series, with warped genius Sam Kieth joining in the bloodletting! A letter from Barrow, Alaska, carries a cryptic warning to a young, curious woman, which leads her down the rabbit hole and face-to-face with her desire... and likely her demise. Elsewhere in Los Angeles, a vampire resurrection ignites, which could threaten the very way of life of all mankind. Features an all-new cast characters being introduced to the world of 30 Days of Night for the first time!